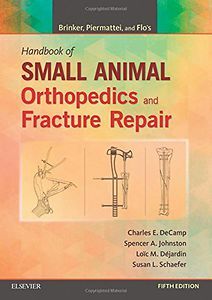 Stay ahead of the rising demand for orthopedic surgery in veterinary practice with the most trusted handbook for small animal orthopedics.Brinker, Piermattei, and Flo's Handbook of Small Animal Orthopedics and Fracture Repair, 5th Edition is the expert reference you need to successfully understand, diagnose, and treat the wide variety of conditions affecting the locomotor system in small animals. As with previous editions, this comprehensive handbook offers readers a clear and consistent description of the most common orthopedic conditions along with the pathology, diagnostic work-up, surgical indications and planning, surgical approach, surgical techniques, complications, and follow-up recommendations that accompany them. 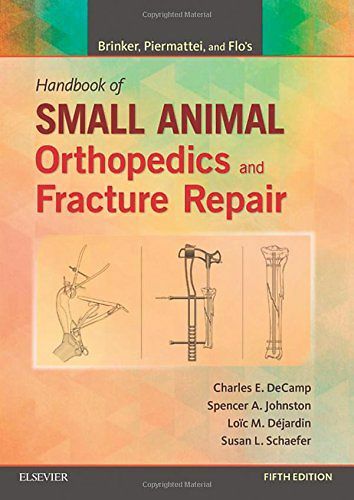 This new edition also includes the latest information on fractures, musculoskeletal diseases, and the advances in methods of fixation, lameness correction, and joint surgery. Not only will readers gain access to routinely used orthopedic treatments - such as plating, wiring, and pinning techniques - this handbook also discusses the more complex modalities - like minimally invasive surgery, and angle stable fixation systems with the newest information on interlocking nail and locking plate technologies. With this unrivaled reference, you ll have the expert guidance you need to successfully diagnose and treat nearly any musculoskeletal case you may encounter in daily practice.